Liver cancer is one of the most common causes of cancer deaths worldwide, leading to over 750,000 deaths annually. October being breast cancer awareness month, you might wonder what the connection is between these two cancers; breast and liver cancer. Well, the liver is one of the places where breast cancer can spread to, causing secondary liver cancer (liver metastasis). Apart from breast cancer other types of cancers that can spread to the liver include lung, pancreatic and stomach cancers. This article focuses of metastasis liver cancer which can often be overlooked. Storing vitamins as well as minerals, among other functions. When cancer spreads to the liver, the liver may be damaged leading to it not performing its functions as required. 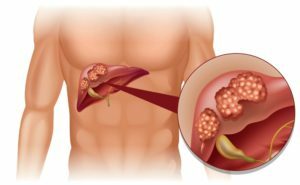 This is liver cancer that occurs when primary cancer from other body parts, spreads to the liver. It is always caused by primary cancer in the pancreas, ovaries, uterus, stomach, kidney and breast, among other parts of the body. How does this spread occur? Even though all cancers may not follow the same process, most of them go through it, which leads to secondary cancers. Local invasion: This involves cancer cells moving from the primary site to the nearby normal tissue. Angiogenesis: The micrometastases stimulate the formation of new blood vessels which then supply oxygen and nutrients to the tumours, helping them grow. Imaging tests: Tests such as computerised tomography (CT) scan, an ultrasound and magnetic resonance imaging (MRI), among other tests. Liver function tests: These are tests done to check whether the liver is functioning properly because when the liver is not functioning as expected, its enzyme levels are usually high. Laparoscopy: A laparoscope (thin flexible tube fitted with a camera and a light is used to view the inside of the abdomen. It is inserted through small incisions in the abdomen. Biopsy: This is done by taking a sample of cell from the liver to check for the presence of cancer cells. Blood tests: These can be done to check a person’s general health. How is Metastasis Liver Cancer treated? The treatment for secondary liver cancer is aimed at controlling the spread of the cancer and the shrinking the cancer tumour(s) so as to improve a person’s quality of life. Chemotherapy is usually the most common type of treatment used, however, the type of treatment depends the location of the primary cancer, the number and size of the tumors, the patients age as well as their general health. due to a person’s health status. It can be done to remove just a section of the liver with cancer, the whole lobe of the liver or part of the liver. Chemotherapy: It involves using anti-cancer drugs to kill, shrink or slow down the growth of cancer tumour. Targeted therapy: This is treatment done to target and destroy cancer cells without harming the normal cells in the body. Hormonal therapy: It works by denying the cancer, the hormones it needs to grow, thereby slowing down or stopping its growth. Radiation therapy: This involves the use of high-energy beams to kill cancer cells and shrink cancer tumours. However, in most cases, palliative care is offered to control the cancer symptoms, and prolong a person’s life while improving their quality of life. There is no known way to prevent secondary liver cancer, however, through palliative care as stated earlier, people with this type of liver cancer can have improved quality of life by having its symptoms reduced and its growth slowed down. By treating primary cancers before they spread to the liver, you can also reduce your risk of getting liver metastasis. Early screening of cancer especially if you have hepatitis, which is a major cause, can help you get early diagnosis which is very helpful in getting effective and efficient treatment which will prevent or stop the growth of the cancer cells.